I have been on a self-imposed break for the past few weeks. Took leave from my teaching job, read few books, did some spring cleaning of my home, watched the movies that i so wanted to, met few of my close friends and went out for lunch at the nearby restaurant from my home. So basically i re-energised myself. And that really made wonders for me! But this resulted in ignoring my blog for quite sometime. Then i realized it is time for a new post and it is not good to ignore my blog baby. So here is a basic stir fry that i made at home for today’s lunch along with rice and sambar. Elephant yam or Chena (in Malayalam) or Senai kizhangu (in Tamil) is one of the stir fry’s that is so much-loved in my home. I remember mom making this stir fry so often for lunch when we used to live in Kerala, as it is found abundantly grown in our backyard along with Chembu (or Taro roots). Yesterday i bought this versatile tuber vegetable and made this yummy Chena Mezhukkupuratti for today’s lunch. Chena could be used in a variety of dishes – that is in Kuzhambu(Sambar), as Chena Roast, Chena Masiyal, Chena Molagootal, Chena Erissery and so on. Mezhukkupuratti / Mezhukkuperatti’s are quintessential and simple vegetable stir fry’s so often made in Palakkad Brahmin households. Typically vegetables are parboiled or steam cooked with little water and then sauteed in coconut oil which enhances the taste and flavor. I just love this simple curry with a generous sprinkle of coconut oil. 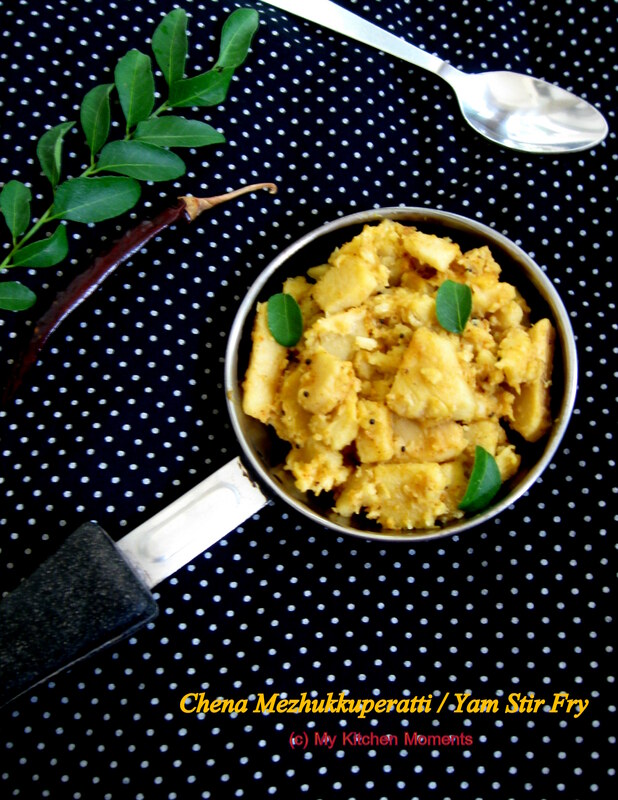 This Chena Mezhukkupratti is a very simply stir fry, which is prepared by cooking the chena followed by a quick tempering. The stir fry tastes amazing when paired with sambar, rasam, moru kootan or even with curd rice. The only trick is to steam cook the yam at the right consistency, so that you dont get a mushy roast. But at my home, we prefer this stir fry to be slightly mushy. Though either way this stir fry tastes delicious. Remove the skin of the yam and cut into medium-sized pieces. Wash the cut pieces of yam well in 2 to 3 changes of water. Transfer the yam pieces into a vessel, add a cup of water and cover with a lid and steam cook it or allow it to boil. (Take care that the pieces don’t turn too soft. If you want, you can allow it to cook till mushy. I wanted it mushy, so i cooked a little too longer). Once cooked, remove from the stove and keep aside. Allow it to cool for a while. Heat a wide pan with coconut oil. When the oil becomes hot, temper with mustard seeds. Then add asafoetida, few curry leaves, the cooled yam pieces, turmeric powder and mix well. (You can mix it gently or else mash it a little more). Add chilly powder and salt as required at this stage and mix well. Let it get roasted well in the open kadai on a medium to low flame. Keep stirring once in a while with or without breaking the pieces. (I mixed the chena pieces by breaking and making it mushy). This may take anywhere between 8 to 10 minutes. At this point, add a little more coconut oil and fry the chena/ elephant yam on a low flame for a few minutes (around 5 minutes or so) or saute until they are well browned on the outside. 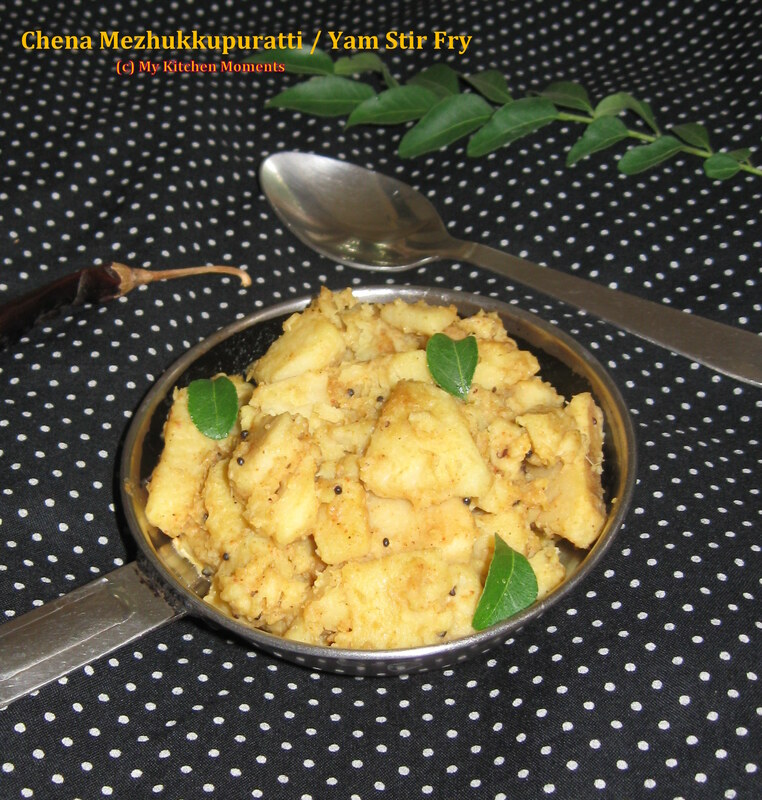 Serve with rice – sambar rice, vatha kozhambu rice or curd rice. Optionally, you can pressure cook the yam pieces for only ONE whistle. Do not add any water in the yam pieces. Just add water in the cooker and place the container with the chena. Close the lid and cook for one whistle. This will make sure that the pieces are cooked well but not mushy. Else you can also parboil the yam pieces in a vessel with water as mentioned above. You can add red chillies and grated coconut, and that will give you Chena thoran. Typically mezhukkuperatti’s are prepared by using coconut oil. So use coconut oil only as it enhances the overall taste and flavor of the stir fry. Adjust the spiciness of the stir fry according to your individual need. Thank you Chitra 🙂 It sure tasted yum!! Thank you Apsara 🙂 One of my favorite too! This looks amazing. I am looking forward to reading more of your blog. Emma. Aishwarya!I got to see this post now only! !Looks super delicious!I love this with a plate of hot,steamed rice!!Yummy! Thank you so much dear 🙂 Mezhukkupuratti with a plate of hot steamed rice is always my go to comfort food! !